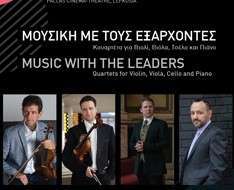 LMS invites you to a unique evening of chamber music for violin, viola, cello and piano with a group of elite performers, holding prestige positions in internationally acclaimed orchestras such as, the Berlin Philharmonic Orchestra, the Vienna Philharmonic Orchestra and the State Orchestra of Thessaloniki. Simos Papanas, Máté Szücs and Péter Somodari join Cypriot pianist Nicolas Costantinou for an unforgettable musical soiree featuring three wonderful masterpieces from the repertoire. Mozart's, majestic and lyrical Quartet no. 2 in E-flat major (the second in the genre) oscillates between concerto-like writing and chamber music textures. Schumann’s lively and rich Piano Quartet in the same key follows. Completed in only twelve days, the work dates from 1842, they year in which Schumann composed most of his chamber music. Despite the fact that the work is rich in references to both Beethoven's style and Bach's contrapuntal writing, it remains a prime example of the composer's personal style. The evening concludes with Brahms’s colossal Piano Quartet No. 3 in C minor, a work full of driving intensity, restlessness, forcefulness and drama. The recital is part of the German Language Month 2018.